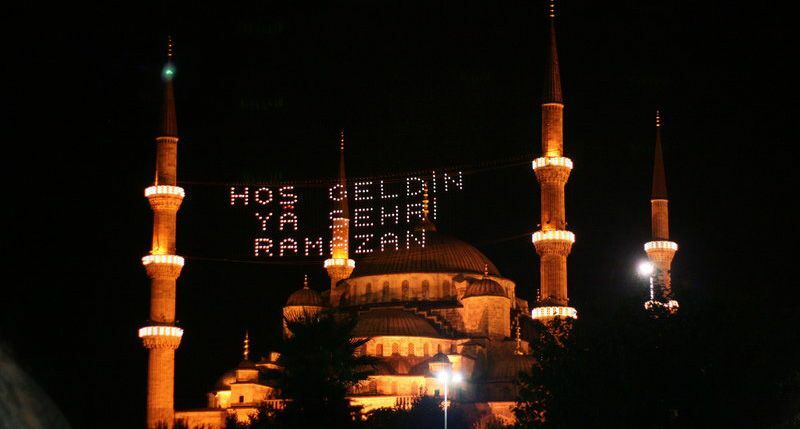 There is a saying in a Muslim country: “Welcome, o the city of Ramadan”. Patience, tolerance, purification, peace of mind, intent, yearning, the flesh, fast and more. The excitement of it begins long before the Ramadan comes. In fact, people welcome the Ramadan two months before it begins. First, comes the month Rajab. First lights are turned on first Friday, the anniversary of the conception of the Prophet Muhammad. Then, comes the month Sha’ban. Ramadan is the third and the oldest brother of this blessed time family. The most valuable guest of the years is coming. Therefore, people begin purify their houses long before the cravings of their fleshes. Everything has to be clean. The social statute of the owner of the house does not matter. Like the poverty, the richness is also in hearts, not in what people see. The cleanliness comes from the faith. The believer is the one who purified his soul, his body, his house, his street and his city. That is why people are excited. A holly guest is coming to houses. Like it did last year and the year before that and the year before that. It will come again to neighbors, neighborhoods and villages. This is an obvious fact. The fast is a holly guest. That is why muslims are so excited and respectful towards it. The coming, staying and leaving of the fast, these are all a festival. That is why, in fact, people prepare themselves not for one but three festivals. They welcome the Ramadan with a great joy and enthusiasm. People welcome it with joy and happiness. Prepare for it with a great enthusiasm. They do their shopping, prepare the vegetables and dry food to use during winter peculiar to Ramadan. People buy food and beverages. The flour poured on the kneading trough meet and gets soften with the pure water spilled by hands of believers and puts its most beautiful clothes on to sit the seat of honor of the breaking of the fast, iftar table. Turns into a bread, a phyllo, a flat bread baked on an iron sheet or a deep-fried pancake. The fast call changes completely the meaning of the food eaten. Adds a different flavor, taste and blessing into it and turns it into a table descended from Heaven. The fast is Muslims’ guest in their homes during the Ramadan. They give the bread and water to it. The seat of honor belongs to it. Especially, when the Ramadan comes, people become enthusiastic. And with the preparations made, as people know already to share, to act with solidarity, many guests are invited to the Ramadan tables. Food for breaking of the fast, food for the last meal taken just before dawn, various offerings, tea and coffee. Sweet made from thin dough sheets, Güllac, ought to be made to improve the taste of the mouth. But it won’t be the only one because the breaking of the fast, iftar tables could only be decorated by generosity. Dried fruits are needed to make compote, rice for making Pilaf and yoghurt to make airan. For the pleasure after the breaking of the fast, iftar, the tea has to be prepared but for the neighbors, too. Ramadan greets with a thin crescent moon people whose hearts become thin. And rise like a sun on the bright foreheads of who welcomes it. All right, now let’s talk about something important. Death is a resurrection gate. Like all the living beings, the dead also belong to us. Aren’t we also dead as well as we are alive? Don’t we born when our heart starts beating and die when it stops? Isn’t the death of somebody else is somehow our own? This is the thing that believers search for in the graves. Not the fear of death but the odor of the eternity. The death is the only fact that nobody can object. The body stops, the breathe becomes silent and the individual travels beyond this noisy world, towards the eternity. S/he forgets about diseases and their cures. Cannot answer when a questions is asked and ask questions when he seeks for answers. Because the eternity which makes a living out of death, is a land where all the answers live. When the breath is cut off, the body stops. The individual is now absolutely submitted to the command of the Creator. The soul reaches its real land. Death has an authentic warmth for us. Cemeteries are not fearful places. The grave is a passageway. A mansion that cannot be undervalued until its time comes. Men, women, children, elderly and youngsters, they all lie in graves. Rich and poor of this world gather at the same place. Everybody’s handed over their skins to the yeast of the skin. To be buried does not mean to cease to exist. Nonexistence is the farthest word to mankind who contains all the worlds, love and compassion in himself. The sun also rises and sets over the graves. They all wait for the prayer. The desire of being remembered provokes to remember. And the grave is the biggest reminder for the livings. The biggest advice. It reminds constantly that this adventure of life will end one day just as it got started. That is why people visit the graves just as they are visiting a friend or a neighbor. Steps, passages through narrow roads between the graves, eyes that touch known and unknown names written on the gravestones, the opening of hands for a prayer, the compassion tears and a dark silence that embraces all. This peace of mind is the secret of the eternity. The reviving breathe of Ramadan softens the gravestones, flowers begin to blossom. Dead mix among us. They tell us that they didn’t cease to exist, that there is no such thing as nonexistence.